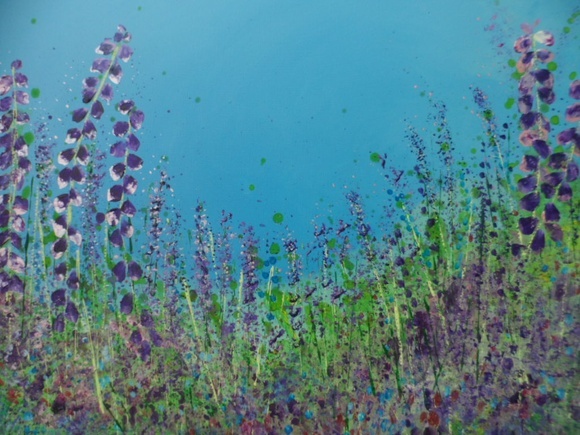 Living in Devon from a young age I have been surrounded by the sea and countryside which has influenced the colours and themes of my paintings. As a child I loved reading Alice in Wonderland and always wanted to escape through the doors into the secret garden. I also drew my flower fairies and created magical lands in my head where they would play. These childhood memories are reflected in my paintings where I am transported back to those innocent times and try to create paintings by combining real life and fantasy. I paint in uplifting colours building up layers of colour and texture. Often dispensing with the brush and use my hands to manipulate the paint so I can feel a closer connection to my paintings. As an impatient artist I often have several canvases on the go so that I can work on one whilst another layer is drying. Some of my art work incorporates dichroic glass, heavy structure gel and resin to give the painting a 3D effect on the canvas.